Every Wednesday! Doors open at 5:30pm. Early Bird 7:15pm. Regular Games 7:30pm. We are at 6581 Library Road, Rt. 88 South South Park , PA. Conveniently located 3 miles from the entrance of South Park at the corner of Brownsville and Library Roads. Visit the Contact Us page for more details. During inclement weather, please watch KDKA Channel 2, WTAE Channel 4, or check our main website for closure notices. Early Bird games Start at 7:15 pm. Regular games start at approximately 7:30 pm. 4 early birds @ 50 pts. Double on Starburst. 250 pts if starburst on 4th game. 15 Regular games @100 pts. 4 two Part Special games @50 pts. & 150 pts. Mini Jackpot @ 400 pts. Winner take all crazy “T”. Extra packs available from $3.00. Uses last number called on every game 1 through 20. NO little diamond, NO big diamond, NO inside 4 corners. If nobody wins, there will be a 100 Point Consolation prize on game 21. 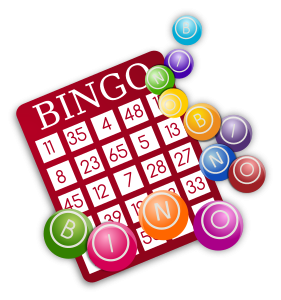 Contact Bruce Rayner at 412-478-5378, bingo@libraryvfc.com or use our Contact Us page.